I digress, this win has been a long time coming. 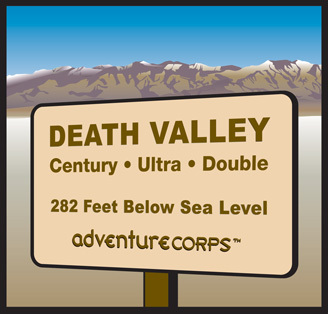 I began doing the Death Valley Double Centuries in 2003. Since then my results have consistently improved year after year. I would have been a good investment if I was stock in your portfolio. As recently as the 2010 Spring Double I placed 2nd (11:07) to Phil Kelley. In the 2010 Fall Double I placed third (11:38) behind Brian Davidson, Emperor Moth, and Daniel Eitman. This year’s Spring Double will be remembered for its stormy weather. You can actually tell your friends and coworkers that you rode in conditions that provided headwinds in both outgoing and return legs. It will also be remembered as the day hundreds of cyclists fought Mother Nature but only a handful had the temerity to accomplished their goal. Many different things have to go right, especially over a 200 mile distance, for a win. I was fortunate, determined, and ultimately victorious. I didn’t hurt more than any other time. I was suffering sure, but the pain felt proportional to the effort and the weather conditions. You know how sometimes you’re riding and you feel like your tires are sinking into the hot tarmac? Or you feel like your brakes are dragging? I didn’t feel any of that. I just felt like I was working really hard and I was seeing the results of my efforts. I thought about Pete Penseyres and his 1986 RAAM when he said nothing hurt. For those who don’t know the name he is a legend in the Ultra Cycling community. In 1986, he set the record for the fastest average speed (15.40 Mph) in Race Across America, a record that still stands 25 years later! In that year, he said nothing hurt, he didn’t need much sleep and he was just riding his bike. I will never pretend to compare myself to Pete. What I will say is that when I ride there are things that I replay in my head such as: articles I’ve read, songs I love and conversations I’ve had. 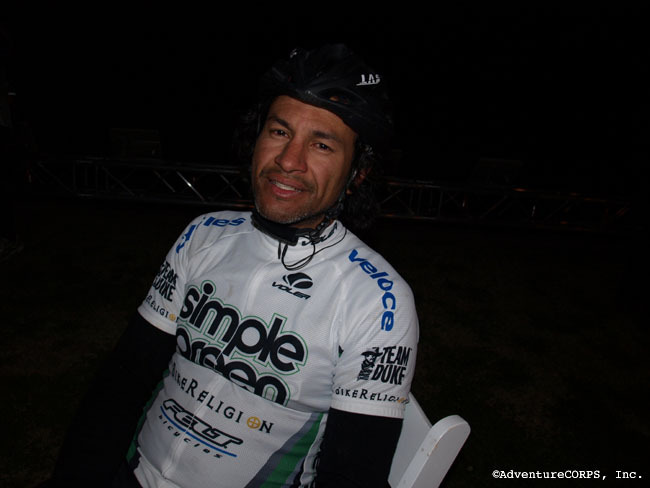 One such conversation I replayed over and over on Saturday was speaking with Pete at RAAM start 2009. His recount of his 1986 RAAM experience kept me turning those pedals. Not only is he a great Ultra Cyclist but a great guy to boot! Badwater Basin, in Death Valley National Park, is the lowest place in North America and one of the lowest places in the world at 282 feet below sea level. The Dead Sea, between Israel and Jordan, is the lowest at 1371 feet below sea level. NUTRITION- Maintained an average of 250 calories per hour. My calories came from Infinit Nutrition in my bottles at the start, homemade gel made with Infinit Nutrition, and supplemented with the nutrition provided by the event. Notice the time for wheels not rolling is only about 11 minutes. I stopped at six aid stations. 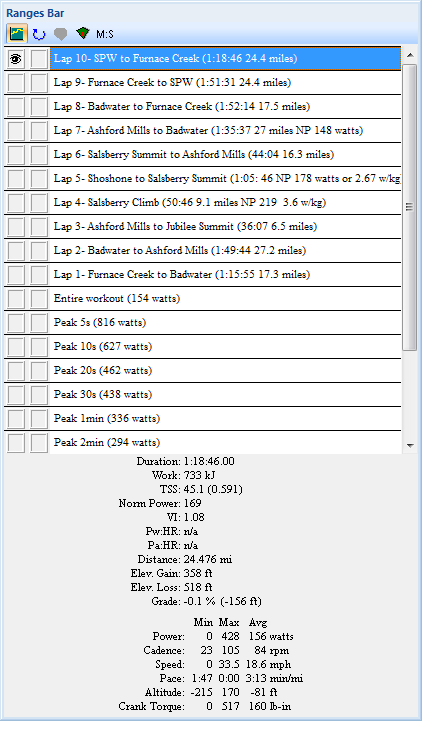 That means my average stop was about 1 min 45 secs per aid station. Not bad but I have to get faster than that. I didn’t go potty for almost 14 hours either. Honestly, I can’t believe I was off the bike that long. How can I have been off the bike 11 minutes when I thought I was only at the stops 30 seconds refilling bottles? The first wave rolled at 6:10 am from the Furnace Creek Ranch. As soon as we made the right turn onto Hwy 127, one mile from the start, I felt the really strong headwinds (steady 20mph-30mph). Heading out to Ashford Mills (Mile 45.5) we quickly established a small breakaway of six riders. We, Red Rooster, Escape Goat, Wolverine, Daniel Eitman, a rider I didn’t recognize, and myself, the Red-Eyed Vireo. worked well together. Do you notice something? 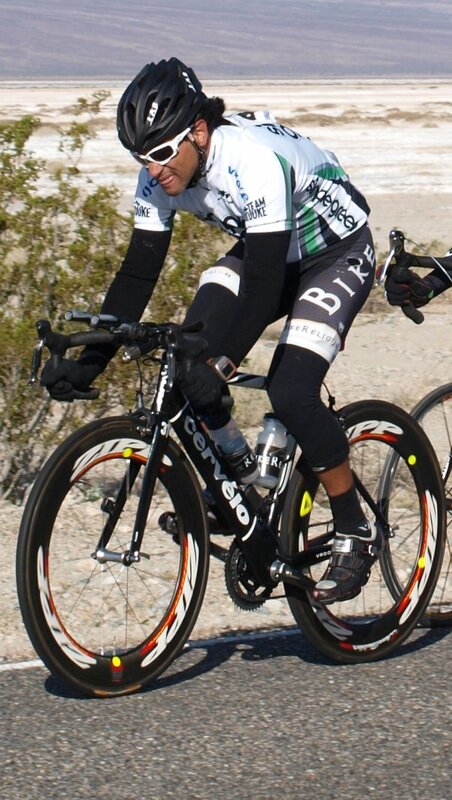 Four out of the six man breakaway are Furnace Creek 508 solo veterans or 508’ers as some call us. 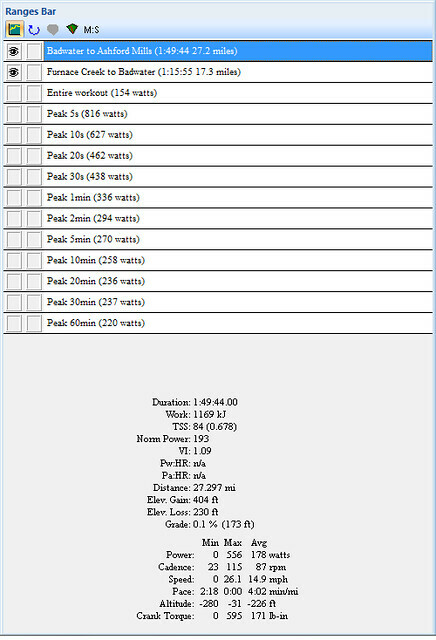 I took very short pulls and hid behind bigger riders. 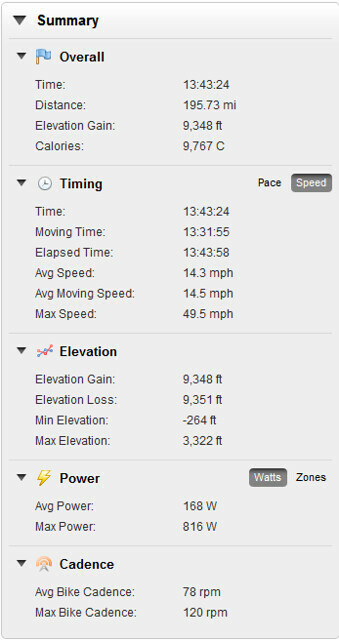 We were doing between 12-15mph fighting that damn headwind. 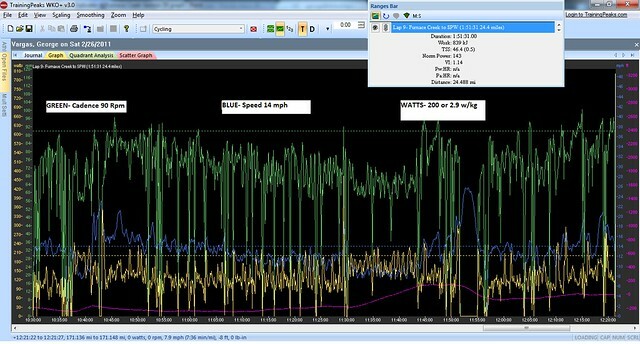 Question- when can a breakaway be established while only going 12-15mph? Answer- When the wind is over 30 mph! Riders at the start of the 200 miles did not want to exert too much energy so they got dropped and the six of us pulled away. Incredibly the wind was so strong that there wasn’t any advantage to drafting behind another rider. The wind just wrapped around the rider in front of you and hit you squarely in the face, chest everywhere. 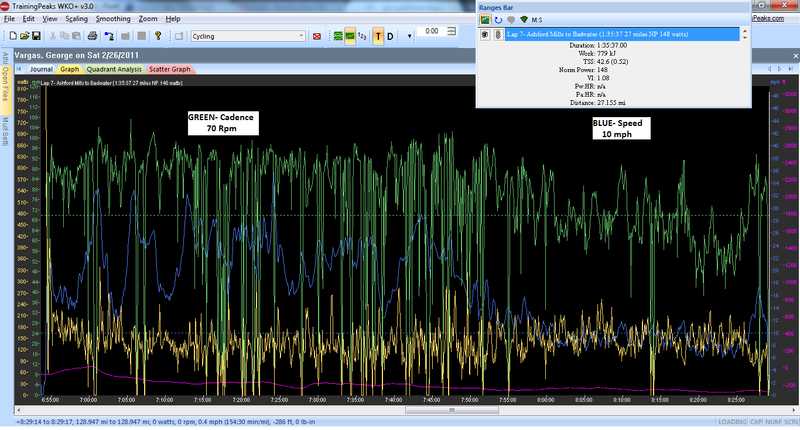 We tried echelons right and echelons left, we tried straight pace lines nothing worked! 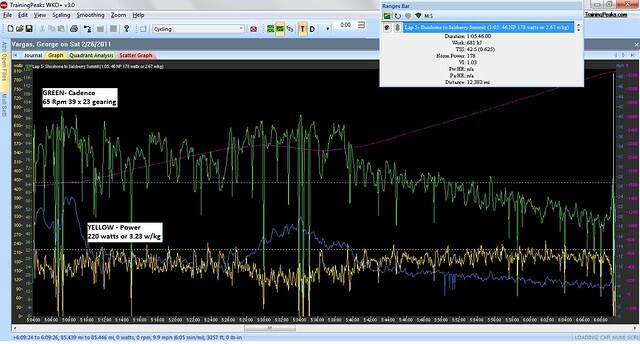 As you can see from the photo above I was riding Zipp 808 tubular wheels which are 82mm deep. I was having troubles keeping the front wheel under control when the wind would shift direction very quickly and become a crosswind. 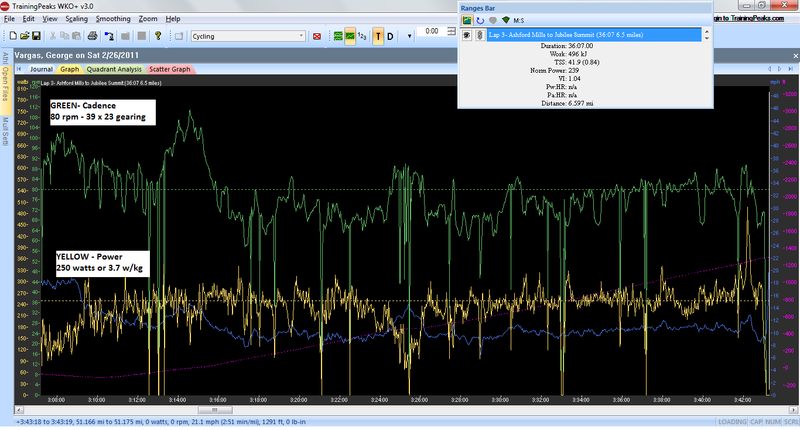 Needless to say I spent very little time in the aerobars. My position relative to the wind AND the rider in front of me were both very important. Not just because I was looking to be shielded from the wind but because I needed to hold a good line for the rider behind me. When the wind would shift slightly it would violently take me off my line and startle the rider behind me. 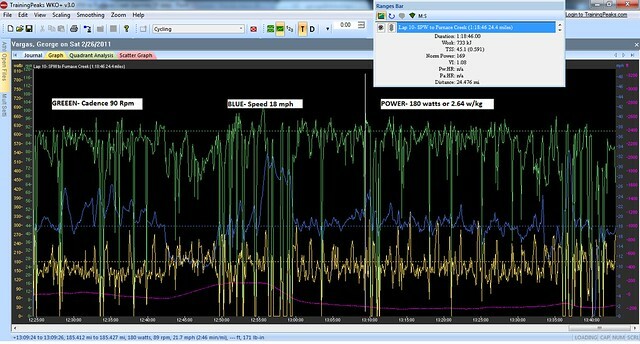 The key for me over the first 45 miles was to ride smart, stay covered and conserve energy. The Zipp 808 wheels were unquestionably the worst wheel choice for that day but that is what I packed for the race and I didn’t have a choice. I had made homemade Infinit Nutrition gel and stayed on top of my fueling regiment. I already had an idea this was going to be a longer than normal double and being more aware of my fueling needs would be the key just to complete the event. 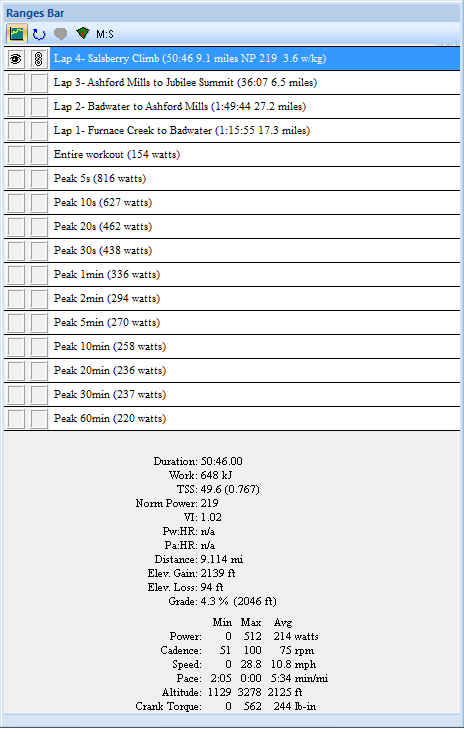 I had planned for 12 hours of nutrition but as you will see it took way longer than that. I was going to come up short with my self-contained nutrition strategy. As I learned years ago, the lead group blows past the Badwater checkpoint at (Mile 17.7) and doesn’t take any support (fuel or water). When you line up at the start you should be prepared to ride from Furnace Creek to Ashford Mills (45.5 miles) if you want to ride with the lead group. Under normal weather conditions that’s not usually a problem. Typically there are tandems at the front and the pace is fairly high. 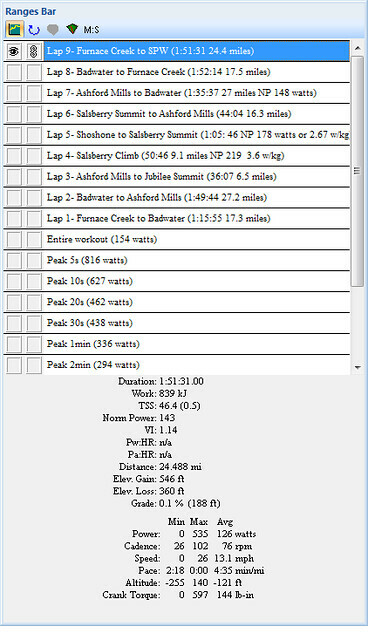 Spring 2010 I was part of the lead group and we reached Ashford Mills in less than 2 hours. This year with the winds it took us 3 hours and 6 minutes to cover those first 45 miles. 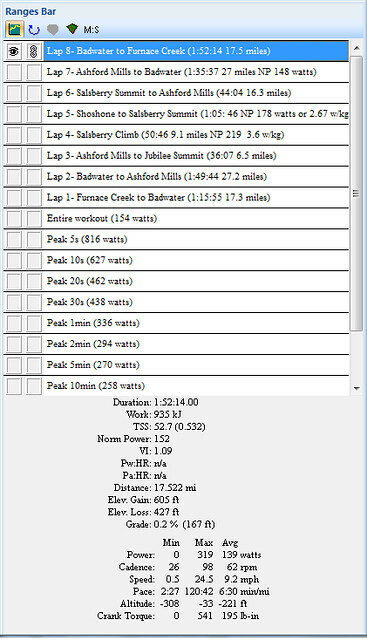 At Ashford Mills (Mile 47.7) I made every effort to be the first to pull in and the first to roll out of the stop. Three scoops in each bottle for the long trek (time wise) from Ashford Mills to Shoshone (75 miles). I had a small gap from the aid station and saw two riders approaching. It was Escape Goat, and Daniel Eitman. I spoke to them about working together to stay away for the rest of the day. However, each time I got to the front to set tempo on the climb I would pull away. So I rolled off a couple of times, sat behind them and let them set the pace. After the third time of me rolling off I just told them that I had to go. I was feeling good on the climb and knew this is where I needed to make my move. I climbed Jubilee Pass (El 1290) and Salsberry Pass (El 3315) alone with no one in sight behind me. When you feel good and you feel like you are on a good day you make your move. We are a close knit group in the ultra community. You ask and encourage your breakaway companions to come with you. But there comes a time when a gentlemen’s agreement is formed and you take your leave and pursue your dreams and your goals. I was in and out of the Shoshone aid station (Mile 74.4) as quickly as possible. 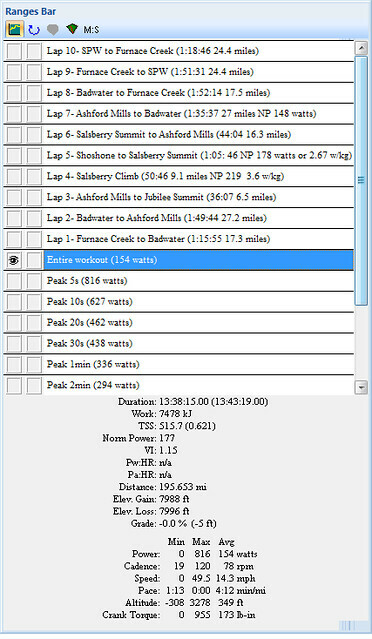 My goal was to get back to Ashford Mills as soon as possible BEFORE the winds shifted to take advantage of what should be a tailwind. 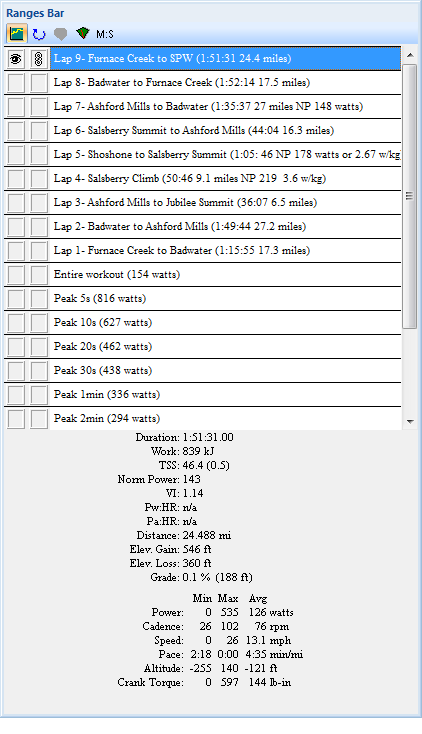 On my way back from Ashford Mills (Mile 103.2) I caught a tailwind for just a few miles. I was going 25-30 mph. I was so happy to not be fighting the headwinds anymore. I had fought them for 100 miles already! I was thinking “awesome my strategy worked”. 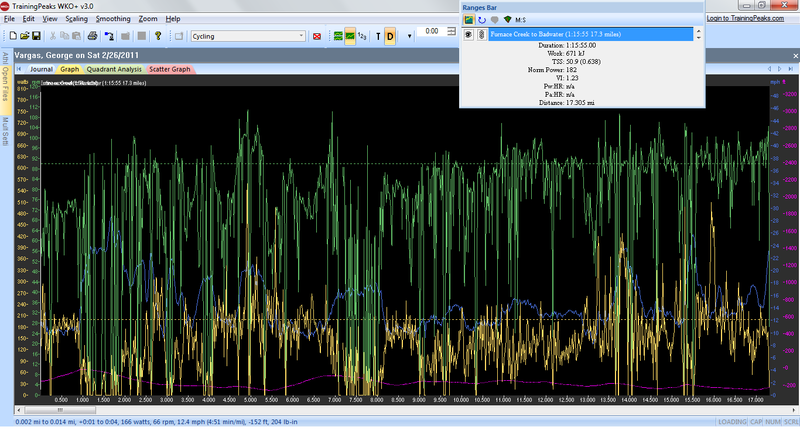 Killing myself over the previous 50 miles over the climbs had put me back on the valley floor with a tailwind. I thought I could really make time while the others were still climbing. But then BAM! all of a sudden I hit a wall of wind. The scary thing was I could see the storm front moving in. In the valley, there is nothing to stop or even slightly slow down the wind. No buildings or trees at all. Death Valley is basically a funnel or more appropriately today it was a wind tunnel. Riding in the wind is more mental than physical it wears on you and wears on you and wears on you some more! Of course, it’s harder to push the pedals against the wind but what’s much tougher is looking down and seeing that all that effort is only moving you at 6 mph. Yes, that’s how slow I was going for extended periods of time. It’s so discouraging. 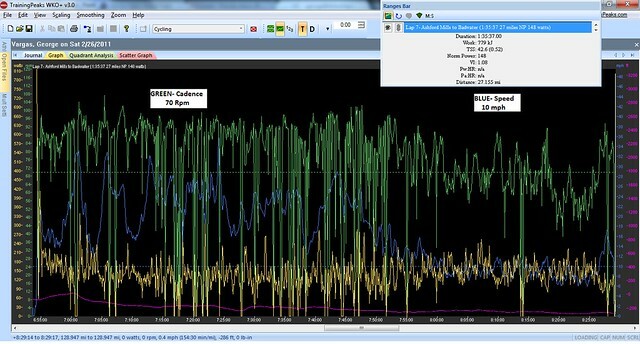 I was doing the math in my head calculating my current average speed and the miles I still had left to ride in the double. When I ran the numbers it was quite daunting. I then thought, “I just need to get to Badwater (Mile 130) and reassess”. You can see the storm front moving through the valley in these pictures. But getting to Badwater wasn’t easy. The wind was so strong (steady 35mph- 40mph) and gusting to 50 mph that I didn’t receive any help from the century riders on their return leg. You could see the storm front coming down the valley. It was an awesome sight! This white wall of water, ice and sand moving its way south through the valley as you were heading North — eventually this wall smacked me in the fasce. My thoughts were, “Brace for impact lol! This is going to hurt!” Headwinds in both directions are very discouraging but remember stay the course and things will turn for the better. The wind was blowing so strong it reminded me of the 2009 Furnace Creek 508 – a 508 mile non-stop ultra with 35,000 feet of climbing. I will never forget how strong the headwinds were that year. Let me set the stage. The Furnace Creek Ranch is Mile 252, Time Station #3 during the Furnace Creek 508. It was around midnight when I left the Furnace Creek time station en-route to Shoshone. Little did I know it would be mid morning before I would reach the next time station. 74 miles took me 10 hours and 41 minutes! It was dark and the only thing you could see were the blinkies of bikes and the amber flashing lights of the follow vehicles in front of you. The winds were steady at 40mph and they were gusting to 60+ mph. Here is an excerpt from my race report of my 2009 Furnace Creek 508. Remember I said that I replay things in my head — one of the things I replayed in my head was Isabelle Drake and I leapfrogging each other and motivating each other to ride through the windstorm to the other side. When you get a chance you should read the rest of the post. 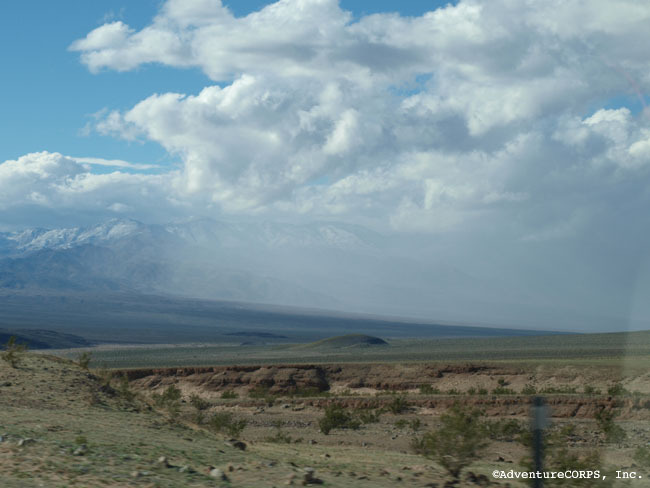 “Turning east onto Towne Pass, the 10-mile, 5000 foot ascent which is the entryway to Death Valley, the (wind) began to blow in a less favorable direction. By the time the racers started to traverse Death Valley proper, near the giant sand dunes at Stove Pipe Wells, the wind was blowing a steady 30mph from the south, with sand blowing across the road like a river. It might have taken race leaders over six hours to complete the Furnace Creek -Shoshone section during the 2009 Furnace Creek 508 but it took me over 10 hours. The race leaders were far ahead of me as they entered Death Valley as such the avoided the worst part of the windstorms that us midpack riders had to experiences. 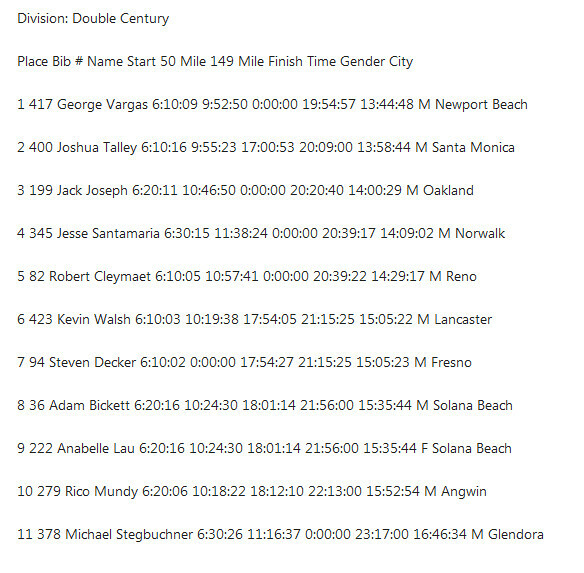 You may be asking yourself why am I talking so much about 2009 Furnace Creek 508 when this is a 2010 Spring Valley Double Century race report? Right? 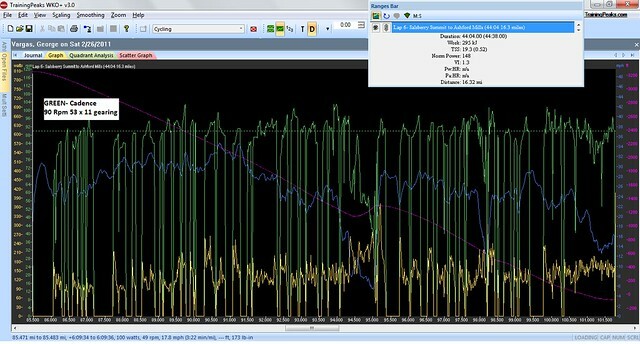 Well the main reason is that the wind conditions were far worse on the 2009 Furnace Creek 508. Knowing I had survived that horrible windstorm in 2009 allowed me the mental strength to keep going. Again, something else I replayed in my head was how bad I suffered on that night. I thought about how much I doubted myself and my ability to continue. I thought about how much will power it took for me to get to Shoshone. And once I put things in perspective, I realized that the winds I was experiencing were not as bad as they were in the 2009 Furnace Creek 508. There was no way I was going to DNF this Double Century. 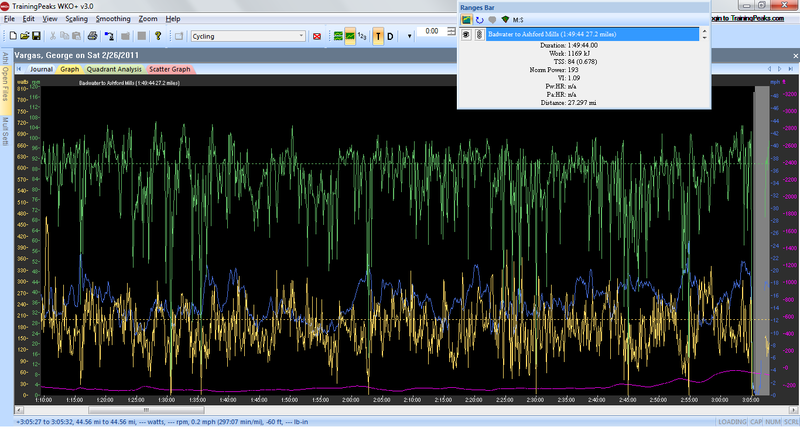 Ever since the 2009 Furnace Creek 508 , I no longer look at headwinds the same way I used to. 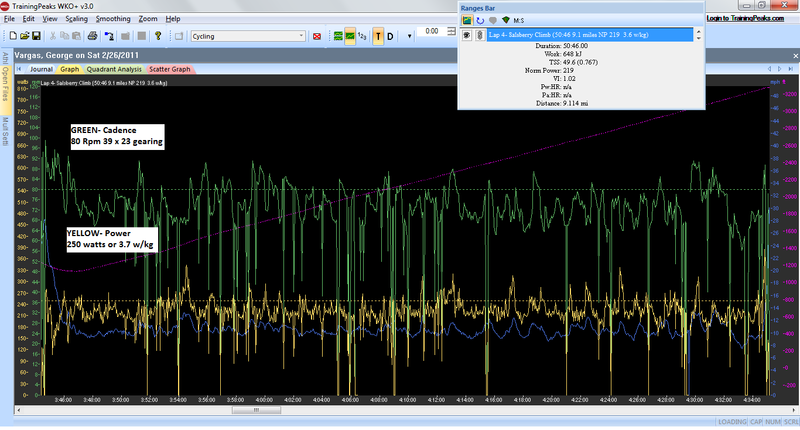 Now when I hear people complain about headwinds (less than 30 mph) I think to myself “man they need to HTFU”. People need to experience 10, 12, 16 hours in 60 mph gusts after already being on the bike for 250 miles and 18 hours before I will feel any sympathy for them. Rule #5 HTFU Finish what you started. Here is a video from the 2009 Furnace Creek 508 of the morning after when the winds had died down significantly. But you can see they are still bad. I’m going less than 10 mph. Badwater (Mile 130.9) I stopped and had a Coke. I couldn’t believe how many people were sitting there. 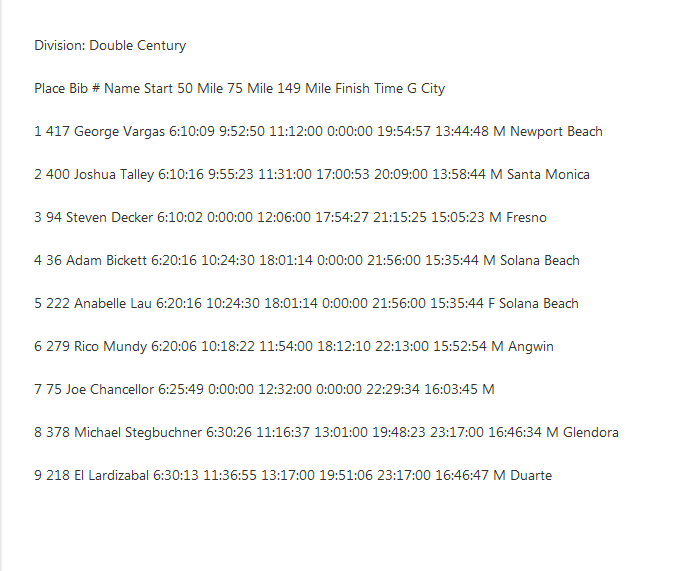 They looked defeated and yet they were only 17 miles from Furnace Creek. 17 miles from the sanctuary. Not the finish line mind you, because as a Double Century rider once you arrived at Furnace Creek you still needed to ride another 50 mile out and back to the North end of Death Valley National Park towards Stovepipe Wells and back. But for century riders it would be the finish line. I wanted to put each rider back on their bike and send them down the road. But riding against strong headwinds is something you have to WANT to do not have to do. You have to WANT it. They didn’t want it bad enough. I thanked the volunteers, gave Emperor Moth a high-five and rolled on. 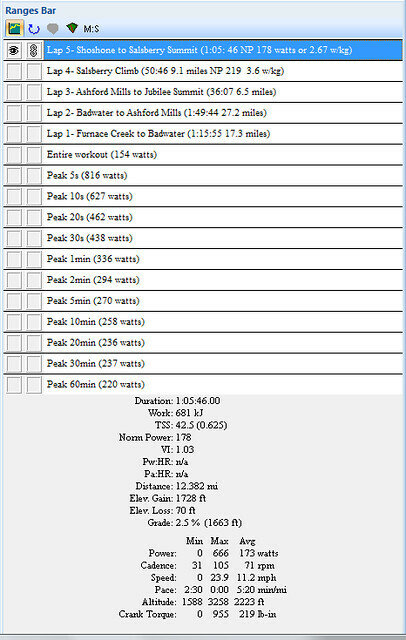 ALMOST TWO HOURS TO COVER 17 MILES FROM BADWATER TO FURNACE CREEK! 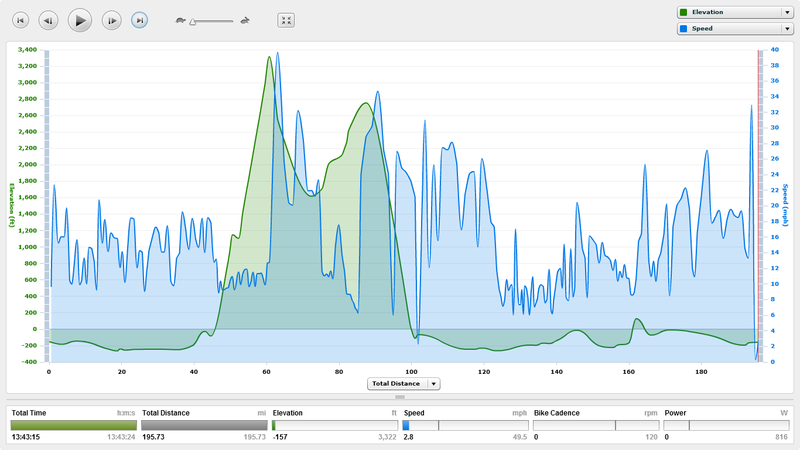 Saturday’s ride was definitely a war of attrition. I received motivation from seeing other riders DNF (Did Not Finish). Allow me to explain it’s not because I’m gloating that other people have failed to achieve their goals. Or that they lost their fight with their demons, gave up and quit. No that’s not it. It’s because when I see SAG vehicles loaded up with bikes on every hook and people piled into every crevice in the bed of a pick-up truck, illegally of course, I think, “yep it’s really tough out here but I’m still standing!” I remember seeing many vehicles with bikes on them. I later found out that people (family and riders that DNF’d) volunteered to shuttle riders back to the finish because AdventureCorps’s SAG vehicles had reached capacity. Remember we are talking about 100’s of riders DNF’ing!! I remembered the CNN overhead shots of the mass exodus from Baghdad during the Gulf War. Yep it looked like that! As I neared Furnace Creek I remember passing a recumbent rider who said “just one mile to go” I replied “for you maybe! I still have another 50 miles!” I then looked back and said “Well done…” I wonder if he heard me over the din of the wind. He was one of the few centuries riders to finish! Good for him!! The week preceding the Double I spent Monday, Tuesday and Wednesday at Cervelo Brain Bike. It is a three-day course where Cervelo educates their dealers on everything from frame design to aerodynamics and more. We spend time in lectures, sharing our meals and yes riding new model Cervelo bikes. At every opportunity that I had I sat down with Phil White, co-founder of Cervelo. 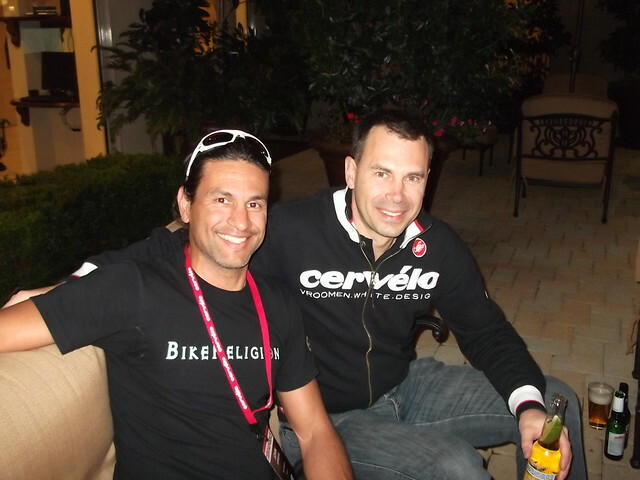 I’ve known Phil for several years now and it’s nice to know that even though Cervelo has grown almost exponentially over the last 10 years that he is still approachable and down to earth. One such time, we were having a drink and talking about the Cervelos I own and how hard it has been for me to sell them. I own four of them – three road and one time trial. I still have a 2007 P3 Time Trial bike, an 2008 R3-SL somewhat dedicated climbing bike (I say somewhat because it’s so awesome to ride anytime 😉 , and a 2008 Cervelo Soloist SL or Cervelo SLC-SL as it is also known. I mentioned to him that I had stripped down my Cervelo Soloist SL, taken pictures of it to post the bike on eBay, but just couldn’t pull the trigger to post it. He replied saying the frames were rare and that he didn’t know if he would sell it. I added that I was interested in selling the Soloist SL for the new and improved S3. As I looked into his eyes I saw a glint of proud ownership. I then realized that the SL projects, R3-SL and SLC-SL, were projects he was personally involved in. The Cervelo Soloist SL was his baby. He shared with me how important the SL projects were to Cervelo. 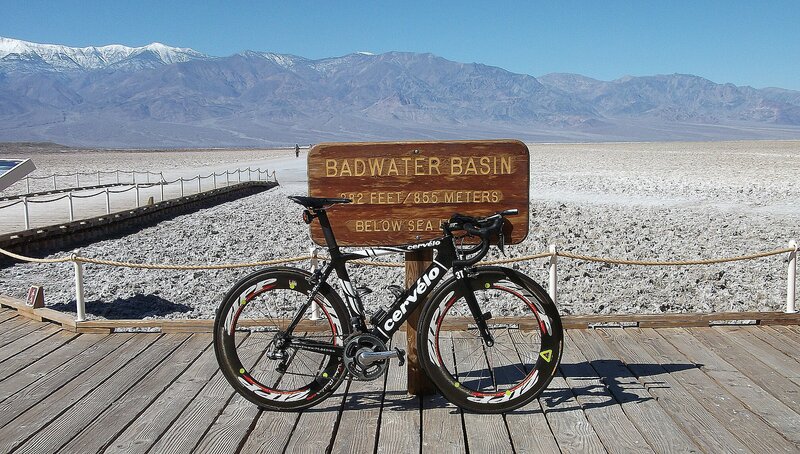 How the R & D from those projects made huge advances in Cervelo’s technology. How the lessons learned from the SL projects really set the ball rolling for more advanced carbon fiber design. My conversations with Phil are another example of things I replayed in my head during the race. Once I arrived at Furnace Creek (Mile 150) I refueled and picked up my long sleeve 100% Merino Wool jersey from Woolistic. 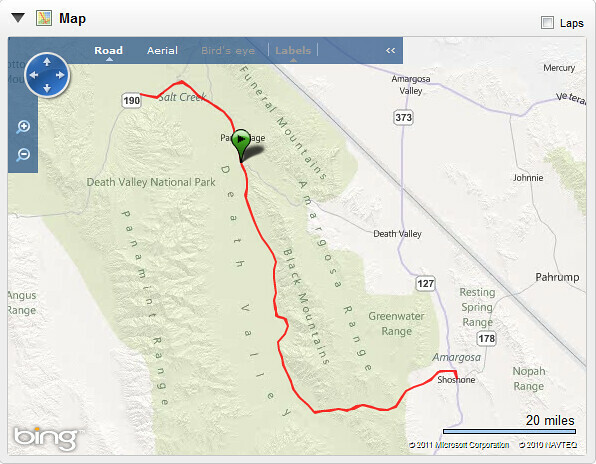 From Furnace Creek you do a 50 mile out and back loop to Stovepipe Wells. As I was returning from Stovepipe Wells I started to see riders on their way to Stovepipe Wells. I hadn’t seen the Double Century riders for many hours. 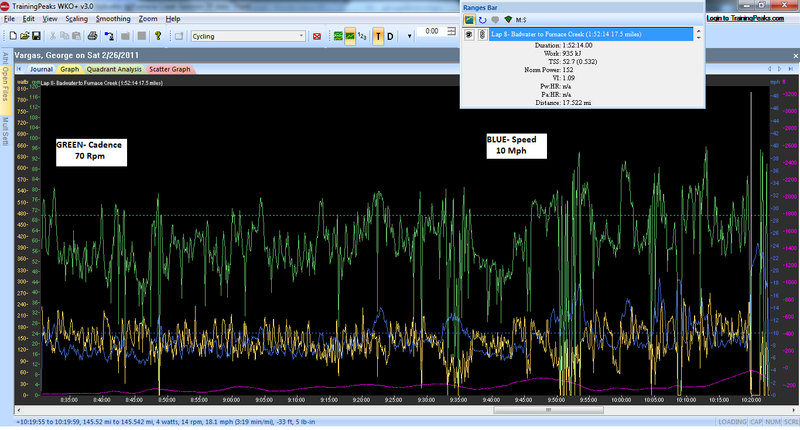 I had been off-the-front of the race riding alone since Ashford Mills mile 43. I was now 175 miles into the event. I saw Escape Goat only three or so minutes behind me. Wow that was way too close with 25 miles to go. He yelled out “You’re the man!” He is really a good sport, a worthy adversary and a good friend. It was several more minutes before a saw a few more riders. And then it hit me — I realized I now was THAT guy! The guy that I always see going the other way to the finish with a huge time gap on me. I was just 25 miles from the finish but I couldn’t let up. I couldn’t get complacent and I couldn’t get caught! My equipment and clothing choices were almost perfect. The only thing I would have done differently is the aforementioned poor wheel choice. A lower profile wheel like the Zipp 404 might have been better. The difference between the 404 58mm and the 808 82mm would have made the front end more manageable in the winds. It was tough riding in a paceline and holding a good line. 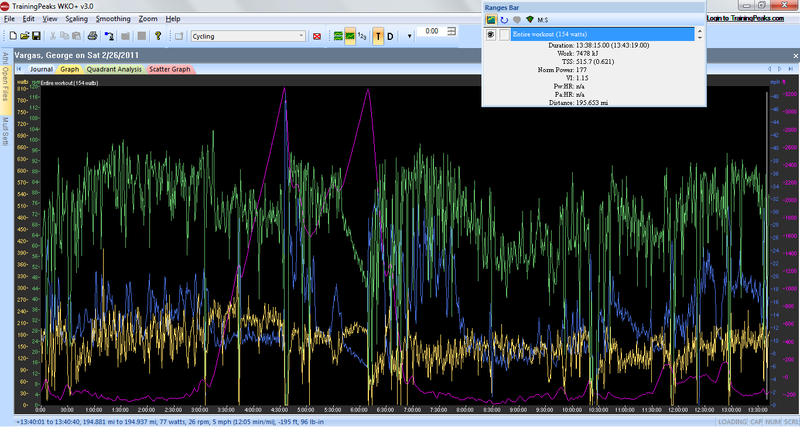 It takes plenty of experience and skill to ride Zipp 808’s in a paceline with the wind conditions we had. I could hear, my friend Wolverine, exclaim when I was blown off my line and he was behind me. EPIC TRAINING TIP: In bad weather you just have to persevere, endure and eventually you will be rewarded with better weather or even better THE FINISH LINE. The challenge is staying mentally focused and realizing that something has to give to get better. That something shouldn’t be you, it can’t be you, it HAS to be Mother Nature, she has to relent and allow you to pass and continue on your journey. One thing you must do when riding is to embrace mother nature you can’t fight her. She is a worthy antagonist and she brings out the best in you. As the protagonist in this story you will prevail. The hero always prevails. Learn to flow with her not resist her. People often ask me “who do you ride with?” I often reply with “I train alone”. Why do I train alone? Well let’s take Saturday’s double century as an example, I rode alone for 150 miles. For a lot of my friends that’s a full week of training 😉 On many of my double centuries I have been in no man’s land just behind the fast group and ahead of the slow group. I spend lots of time alone at Double Centuries and of course on the Furnace Creek 508 there is no drafting in packs or pace lines it is a essentially a 508 mile time trial. EPIC TRAINING TIP: If you aspire to be an ultra cyclist then I recommend you train alone at least once or twice a week. You want to be pushed, or need motivation to get out of bed fine join a group ride. But I suggest you ride to and from the group ride. I strongly recommend you ride a solid six-hour training ride ALONE. Why do I train alone? Because 150 breakaway is a lonely time on the road! But it doesn’t have to be. Replay the conversations you’ve had and relive the memories of your dearest friends, your idols, or your family. On Sunday the weather was ideal for racing. What a difference a day makes right? 24 little hours …. Huge thanks to all the volunteers. AdventureCorps for putting together a well supported event. 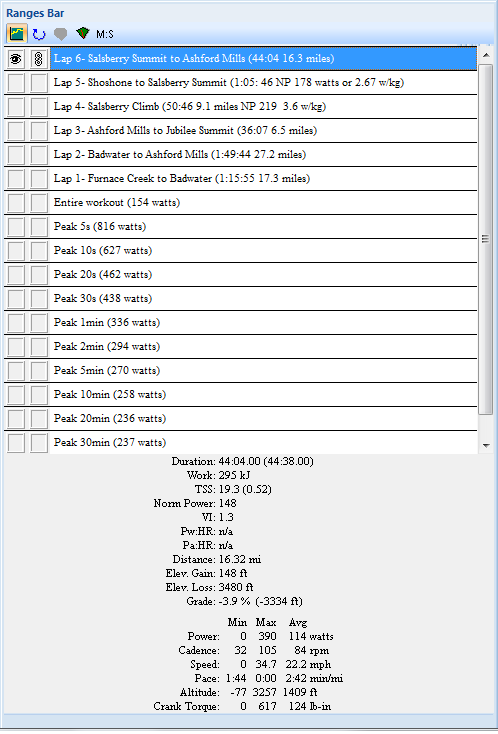 Even with the huge DNF rate AdventureCorps seemed in control. Chris Kostman is a true leader and it showed on Saturday. Huge thanks to my sponsor for covering my entry fees and lodging in Furnace Creek. So many more people to thank: Simple Green/Bike Religion, Swiftwick Socks, SRM Power Meters, Fizik for their saddle and awesome insoles, Woolistic for their 100% Merino wool base layers. Adobo Velo thank you for always inviting me into your family and sharing a meal with me. You guys rock! My friend, Daniel, passed me the link to Montana Timing for the preliminary results, here. Looks like only 11 Double Century Riders finished. Now that I’m home it’s back to life back to reality 😉 (who remembers that tune?) I will get a report together soon. Thank you for all your comments they are very much appreciated. Thank you for choosing to read my blog! Low: 41°F MOSTLY CLOUDY. A CHANCE OF RAIN AND SNOW. SNOW LEVEL 3000 FEET DECREASING TO 2000 FEET IN THE AFTERNOON. 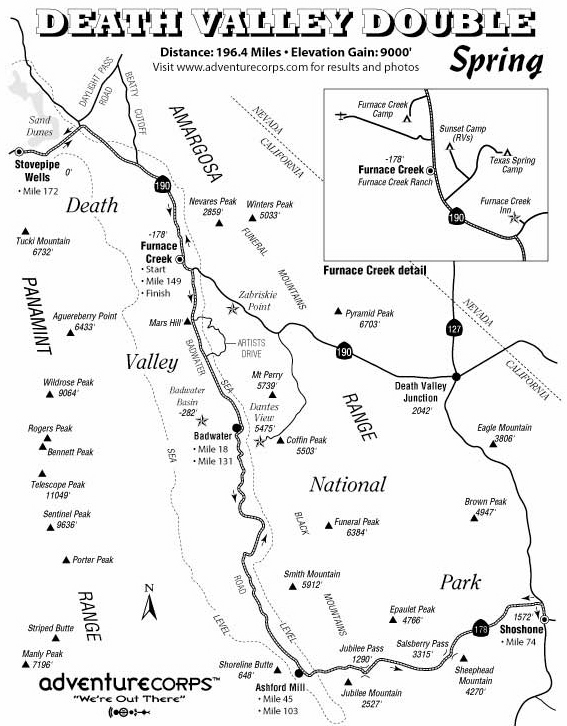 HIGHS 32 TO 47 IN THE MOUNTAINS…AROUND 60 AT FURNACE CREEK. SOUTHWEST WIND 10 TO 15 MPH. CHANCE OF PRECIPITATION 50 PERCENT. OVERNIGHT: MOSTLY CLOUDY. A 20 PERCENT CHANCE OF SNOW IN THE EVENING. 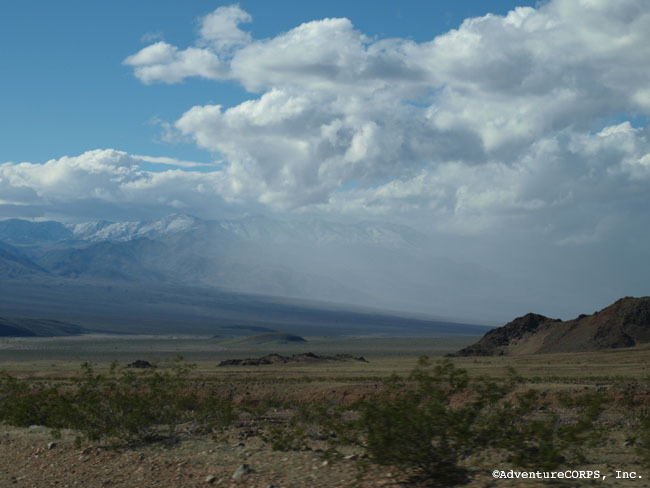 LOWS 21 TO 27 IN THE MOUNTAINS…AROUND 41 AT FURNACE CREEK. WEST WIND 10 TO 15 MPH. 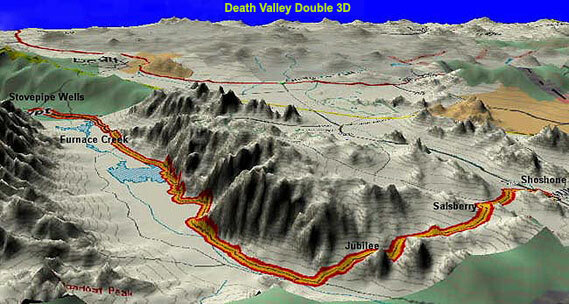 On Saturday February 26, I will be participating in the Death Valley Double Century Spring Southern Route. Many thanks to my sponsor for making it possible for me to ride in Death Valley, one of the most spectacular places on earth. I hope to do well. I placed second last spring to a very fast Phil Kelley. 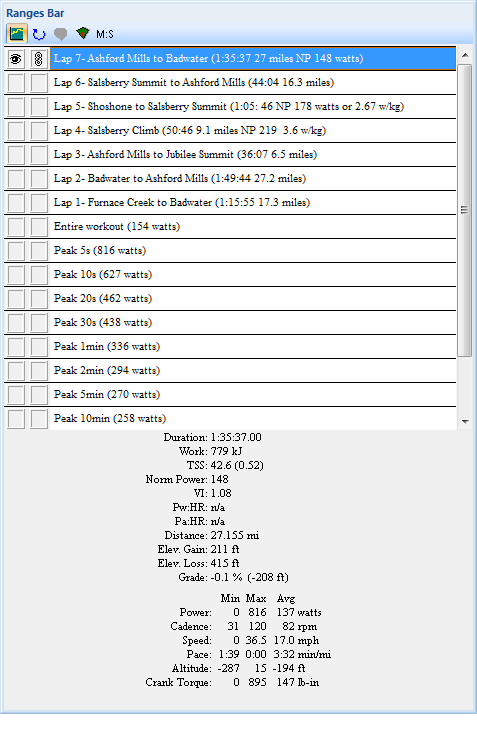 Here is the race report for last year’s event. I was also in much better form than I am today. In October, I placed third on the northern route. First was Brian Davidson, second was Daniel Eitman and then me. Daniel is on the roster to ride and Brian is volunteering thank goodness 😉 But my friend, Adam Bickett, Rock Rabbit, another very talented rider, is on the roster. Looks like I will have to ride really smart to stay-in with those fast guys. It’s early in the season so my goals are a top ten finish and a sub 11:30 time. Anything better than that is all gravy as they say. Stay tuned for the race report. As always thank you for choosing to read my blog. Please pass it along to you friends!